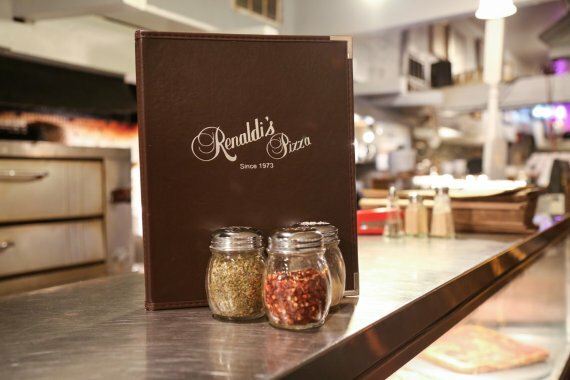 Renaldi’s takes great pride in introducing for the first time in the United States Spingione Pizza. Spingione’s. means “light and fluffy” in Sicilian. A favorite in Sicilian homes. We are the first to produce pizza in the US. All sandwiches served w. fries. On garlic bread or w. cheese. Add Hot or Green Pepper. Homemade sausage patty topped with hot or Mild giardiniera. All Dinners are served w.soup or salad, Bread & Butter. Served w. Salad & Mostaccioli. Served w. choice of Pasta or Potato Wedges. Tossed in our Signature Vodka Sauce. All Pizzas have Cheese & Tomato Base. Sausage, Mushrooms, Onion, Green Peppers & Pepperoni. Mushrooms, Onions, Green Peppers, Broccoli & Spinach. Our signature Panini w. your choice of meat & cheese : Ham, Turkey, Prosciutto, beef or chicken Cheddar, Provolone, Mozzarella. Black olives, green pepper, spinach, broccoli, Mushroom & artichoke hearts. Sausage, mild Giardiniera w. Mozzarella cheese. Big Enough to be shared with friend. Big enough to be shared w. a friend. Garden leaf spinach, topped w. fresh mushrooms, tomatoes, onions, cucumbers, black olives & hard boiled eggs. Fresh mozzarella slices tomatoes topped w. fresh basil served w. mixed greens & toast points. Fresh spring lettuce w. strawberries or cranberries & walnuts. Tossed in Alferdo’s own balsamic vinaigrette dressing. Lettuce, avocado, bacon, onions, tomatoes & crumbled blue cheese. Iceberg Wedge topped w. Bacon, tomatoes & Onions. Prepared w. light tomato sauce & olive oil. Our Stuffed pizza is one the the best in Chicago. Give it a try today you will not be disappointed. Try Chicago’s best stuffed pizza today. All Pasta Dinners are served w. Bread & Butter. W. Butter Sauce, Garlic, Oil, Mushroom Sauce, Tomato Sauce or Meat Sauce. Add Meatballs or Italian Sausage. Meat, Cheese or Spinach w. Cheese, Meat Sauce or Tomato Sauce. An array of Italian Delicacies. Topped w. cheese, bacon & ranch dressing. Potato skins, Onion Rings & Chicken wings & Cheese Sticks.